Tens of thousands of train passengers faced long delays after faulty signalling equipment caused major disruption across London. People travelling through the capital have been told to avoid London Victoria station if using Southern, Gatwick Express or Thameslink trains. Journeys have been cancelled and delayed by up to 60 minutes after the fault in Streatham, south London. National Rail said disruption will last until at least 07:00 BST on Friday. Passengers are advised to check the Southern website in the morning to see whether trains are running. They had initially been told to expect normal services to resume by 14:00 on Thursday after the fault was discovered on Wednesday night. Network Rail, the government-owned company responsible for maintaining rail infrastructure, offered a "sincere apology" to customers. 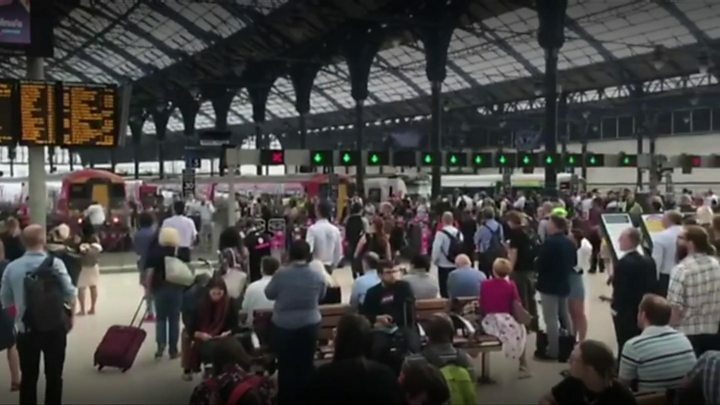 A statement from Network Rail said that while a "temporary fix" was put in place after engineers worked overnight, significant disruption would continue across affected lines. Victoria is the second busiest station in Great Britain. About 210,000 passengers use the station a day, according to average figures collected for the Office of Rail and Road (ORR) in 2016-17. Gatwick Express services were suspended on Thursday while Southern and Thameslink trains were badly affected. Kevin Liffey, 54, earlier missed his sister's funeral in Jersey because he could not get to Gatwick Airport from his home in East Finchley in time for his flight. That was despite spending £90 on a taxi from Victoria after being told he would not be able to catch the Gatwick Express from there. He said: "It just shows we cannot rely on public transport at the most basic level. "It's just not really acceptable in a country that's as developed as it is." Gatwick Airport said flight passengers should leave extra time for their journeys. Adam Parker, 32, said he was "close to breaking point" after the three-hour journey from Hove into work on Thursday morning. The Nickelodeon producer said: "There are only so many times you can tell your boss you're late again because of the trains, only so many times you can miss a meal at home." Southeastern trains said its services to and from Victoria were running normally but Thameslink reported knock-on disruption between Luton and Wimbledon. Trains were packed during the morning rush hour as commuters with tickets to Victoria were allowed on board other services. Elaine Hindal said her train to London Bridge was a "nightmare" and "dangerously overcrowded". Michael Scriven said he tried unsuccessfully to board eight trains to London Bridge at East Croydon station and was "the most sardined I've ever been" when he eventually managed to get on one. The 23-year-old IT analyst said the platform became an "absolute mess" after passengers were forced to disembark from trains travelling to Victoria. John Halsall, Network Rail's managing director for the South East route, said: "I would like to offer a sincere apology to everyone who has had their journey disrupted today. "Our job is to provide a reliable railway for train operators and the travelling public and today it's clear we've failed in that task. "We've now been able to restore signalling and trains are beginning to run again to and from London Victoria, though passengers are advised to check before travelling throughout the day as knock-on impacts are likely to be significant." The disruptions come as Govia Thameslink Railway, (GTR), which operates Southern, Gatwick Express and Thameslink, is set to launch a special compensation scheme for people severely affected by a chaotic timetable change in May. Across other Southern, Thameslink and Gatwick Express trains. London Underground to and from Wimbledon. London Overground between Clapham Junction and Watford Junction / West Croydon. London Northwestern Railway between Watford Junction, London Euston and Milton Keynes Central. Metrobus to and from Gatwick Airport. Southdown Buses between Oxted and East Grinstead. Compass Buses in the Tunbridge Wells area. Have you been affected by the disruption to train services today? Please get in touch by emailing haveyoursay@bbc.co.uk.